The Central Indiana Regional Blood Center is reporting a critical blood shortage. I know this because when I drove past the main branch of the blood center today, there was a sign out front that said Critical Blood Shortage. Two blocks later, I heard an ad on the radio saying the same thing. Then about an hour later, the Blood Center called to ask if I could come in to donate. I'm thinking God is trying to tell me something. So I went to www.donorpoint.org and made an appointment to donate. I gave myself two days to load up on iron-rich foods, because low iron often quashes my intention to donate. 10. The blood center will never say "Sorry, you're not my type." 9. You might weigh 1/2 pound less after you donate, a whole pound if you sweat anxiously about the needle. 8. It's a great -- and free -- mini check-up of your blood pressure and cholesterol levels. 7. Your boss will look like an evil villian if s/he turns down your request for a longer lunch hour so you can donate blood. 6. You get snacks after you donate. 4. The blood draw-ers (I'm too lazy to look up phlebot....) are super nice. 3. The blood center is air conditioned -- a plus when the weather is 85+ and humid. 2. As CIRBC likes to say, you'll have someone's undying gratitude. 1. Know that saying, "if it feels good, do it?" Well GIVING feels REALLY good! If you're not in Central Indiana, go to your own local blood center and give up some of the life-giving red stuff. Though I’m sure I knew it before, this bathroom painting drama has shown me that I have two different types of friends. First, there are the supportive, let’s-make-the-best-of-it type friends. 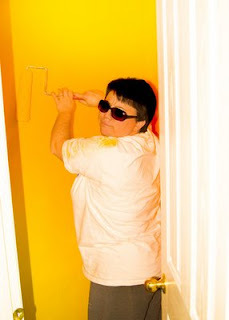 Like my friend Jane, who willingly risked her retinal health to put two final coats of ultrabright orangey yellow paint on my bathroom walls. That would be coats seven and eight for those of you who are counting (2 coats primer + 6 coats paint). Jane’s efforts at least evened out the paint job that I’d done (and redone and redone and redone – well you get the picture), though the extra coats just added to the literal glow of the room. “You know, once you get the mirror up and hang your pictures, it will tone down,” Jane tried to assure me. Then there are the equally supportive, tell-it-like-it-is-for-your-own-good type of friends. Like my Friday morning coffee buddies, Beth and Denise. They were well aware of my bathroom redecorating trials and tribulations. So, when I told them that I needed to head back into the bathroom to paint the trim, Denise spoke up. Ummmm….hello??? She loves to paint? Why didn’t she speak up five or six coats ago? Unable to contain my excitement, but also wanting to make sure Denise knew what she was getting into, I brought Denise and Beth to the house to see the bathroom. Now, up to this point, I thought these two were friends of the Jane variety – that is I thought they’d get a little chuckle at the radiance of my bathroom walls, but that they’d pat me on the back and say all would be well. So, we stood in front of the open bathroom door, I flipped on the light and what did these two church-going friends of my have to say? In about 3 minutes time (they couldn’t stand to look any longer than that), the plan had escalated from Denise painting the trim to an old-fashioned intervention: Beth and Denise would re-paint the entire bathroom. Before they left the house – once their eyes had re-adjusted to the dim level of daylight – I had a list of supplies they would need, including Kilz primer in white, and yellow paint at least two shades later than the “Sun Ray” shade that I’d already painted. The plan was that they would return the following Friday, foregoing our usual Friday morning Panera routine. So Thursday night, I returned to Home Depot, supply list in hand. Rather than just moving a few shades down from Sun Ray, I leaped to a whole new palette of yellow, selecting “Lemon Sorbet” after much consideration. I called Denise on the way home and offered to cover the walls in the Kilz primer before they arrived, if she thought that would help. Now, I have to admit that wasn’t 100% sold on the need to repaint the bathroom. Would Jane’s feeling be hurt when she found out that her efforts had been covered with Kilz? We hadn’t even tried to diffuse the color by hanging the pictures and mirror in the bathroom. Was I jumping the gun by letting Beth and Denise have their way with my bathroom? I got my answer when I turned on the bathroom light later that evening. Everyone was in bed and I was on my way there. I turned out the lights in the family room and kitchen. As I walked by the bathroom, I flipped on the light to view the bathroom in all its golden splendor once more. “Aaaaaaaahhhhhhh!” I swear I heard the “Hallelujah Chorus.” The glow from the bathroom was such that I was almost certain the gates of heaven had been opened and I was being summoned to go toward the light. Except, instead of the warm, peaceful feeling I’ve heard near-death survivors tell of, this feeling was eye piercing and downright painful. “Ok, I’ll let them paint tomorrow,” I decided. Friday morning arrived and so did Denise and Beth. After a little coffee and chit chat, they got down to business. In about an hour, eight coats and four days worth of painting were history, covered with two coats of white Kilz primer. Time for the next course…Lemon Sorbet. “Amy!” Ok, that does not sound good. “You were supposed to go two shades lighter!” This was Beth screeching in disbelief. There was no point in protesting. Apparently, Lemon Sorbet is to Sun Ray as Cruella DeVille is to the Wicked Witch of the West – different name, no less evil. Which led to all three of us going BACK to Home Depot for a third paint selection. This time, my job was to whip out the credit card and to get lunch on the way back. I stood quietly while my friends debated the differences between Sun Shower, Citrus and Pale Daffodil. Sun Shower prevailed and went on beautifully in one coat. All in all, the bathroom that I decided to paint myself to save money took five people (six if you count Robbie), two different primers, three different yellow paints, two weeks, 11 coats and nearly $300. I think when it’s Robbie’s turn for First Communion, we’ll have his party somewhere besides our house. It’ll be a lot cheaper in the long run. This experience making over our downstairs bathroom has led me to realize the value in recognizing one’s own limitations. I am creative – in an English composition sort of way. Not in a painting masterpieces – or walls – sort of way. Though I had planned to take all of the kids’ Spring Break off from work, an event next week needed my attention, so I went to the office on Thursday. I wasn’t heartbroken as it gave me a legitimate reason to avoid painting another coat of Cheez Whiz, er, paint, in the bathroom. Before I left, I remove the gallon of paint and the paint tray from the bathroom so no one would get any wise ideas about helping out while I was gone. At about 2pm, I got a mildly panicked call from the babysitter. Robbie had been in the bathroom a little longer than usual. “Oh no,” I thought. “He’s covered himself in poop.” No such luck. Hence, the panicked call. In my rush to get out the door, I had overlooked a paint roller, wrapped in plastic wrap, sitting in the sink. Robbie found it and had painted the toilet and the sink! So I did what any other slightly warped (must be all the paint fumes) mother would do in that situation. I burst out laughing! Sarah, thinking me a bit nuts, wasn’t sure what to do with my response. I couldn’t really be angry with her or Robbie – I was the one who’d overlooked the roller. She was relieved when I told her that we are going to replace the toilet anyway. Then I had her put Robbie on the phone. “Yes, Mommy,” said a contrite little voice that knew he was busted. “Ohh-kay,” came the reply, still a bit worried. I hung up the phone, thinking this latest development was pretty much par for the course of this painting adventure. Sure enough, the back of the door has the mark of the mini painter. That’s not gonna be so easy to clean up, I’m afraid. Since the paint on the door had already dried, I was not in a huge hurry to tend to it. So, I close the door in denial and start to fix dinner. Which led to the second paint-related discovery of the evening. Let me just preface this by saying that if you ever build a house and they give you the option of installing a utility sink, spend the extra money and do it. We did not. Which is why I washed my paint tools out in the empty kitchen sink. Well, apparently, I did not rinse the painty water down the drain enough or something else mechanically similar that I am not smart enough to figure out. Because when I opened the dishwasher to get out the clean dishes to set the table, streaks of painty water clung to about every other dish. Arrrgh! So, now, in addition to painting two more coats of so-bright-I-gotta-wear-shades yellow and figuring out how to get the paint out of the grooves of the back of bathroom door – I’m thinking of turning it into modern art by slapping some other colors up there with the yellow and putting a frame around the whole mess; I had to unload the dishes, run an empty cycle through to clear out the water, re-load and re-wash all the dishes. Mike has forbidden me to ever paint anything again – including my fingernails. I have come to recognize my limitations as a handy-gal and have developed a newfound respect for professional painters. As for the bathroom, when it’s finished I’m thinking of hanging a basket of sunglasses inside the door so the simple act of “doing your business” won’t result in permanent vision loss. For Part III of Adventures in Painting, click here. Sometimes it might be easier to be Baptist. My son Charlie is preparing for his First Holy Communion. Generally, in the second grade, Catholic boys and girls learn about the mystery of Jesus Christ being present in the Eucharist. It is a critical step in the Catholic faith. At the same time, their parents try to solve mysteries like “what is that melted into the carpet and will it come up before the First Communion party?” They look at their homes with a critical eye, determining what must be attended to before guests will be allowed into the house. I’ve known this event in Charlie’s life was coming. And I’ve known that the first floor bathroom needed serious attention before the festivities. So, last weekend, in an unexplained burst of energy, I peeled the no-longer pretty picket fence wallpaper border from the walls of the bathroom. I went to the basement, dug out a print that has been in storage since we moved to this house 10 years ago and determined it to be just right to be the focal point of the new bathroom décor. I took down the oversized mirror that I’ve hated for years. And I made the first of two big mistakes in this bathroom re-model. First, I decided that the walls would go from chambray blue to sunflower yellow. Then – here comes the second big mistake – I decided that I would do the painting myself. So, I took all the hardware off the walls. No problem. I walked into Home Depot and purchased spackle, painter’s tape, primer, paint and this cool little edger thing that would make getting up to the ceiling and down to the baseboards easier. I even knew to have the primer tinted yellow. Pretty smart, huh?! I spackled and re-spackled where needed. I sanded the spackle down to a smooth finish. So far, so good. Expertly masked off the baseboards and vanity with painter’s tape and began to wonder why we had wasted so much money hiring people to do our painting for us. Now it was the time I’d been waiting for. I cracked open the lid of the primer and stirred it with excitement. It was such a good color, maybe I’d only need one coat of primer and one coat of paint. I used the handy edger tool and filled in the rest with the roller. A few drips on the floor (and a couple of new “blonde” highlights on my dark hair), but not too bad. By this time it was after midnight, so I decided to call it a night. I washed out my paint tools and fell into bed. In the morning light, I could see that one coat of primer was not going to be enough. So I set up shop to apply a second coat of primer. Two coats of primer, one coat of paint. That might do it. Annie asked if she could help and quite frankly I was ready for a little break. Since it was just primer, I figured it would be all right to let her try. Besides, it would be good life experience for her. And really, she didn’t do a bad job. Well, except for the tiger stripes that now line her bangs. And the strip of yellow primer running down the white vanity. But all in all, not too bad. Lunch time brought another painting “time out.” A hearty meal of pigs-in-a-blanket and strawberries strengthened my resolve to get back in the bathroom and put on what I hoped would be the first and final coat of real paint. On the walls, on my hands, on my feet. My resolve to be a careful painter was beginning to wane. I was frustrated that while the edger did make nice, straight edges, when the paint started to dry, the “frame” created by the tool was quite apparent. I burned my wrist on hot light bulbs while trying to paint around the light fixture. One coat on. Not enough – by a longshot. Probably will require at least two more coats. Do professional painters give you a sympathy discount to finish the job you’ve foolishly already started? If it weren’t for First Communion, my bathroom would still be chambray blue and my feet, hands and hair would not be sporting streaks of sunflower yellow. Somedays it seems it might be easier to be Baptist. For Part II of Adventures in Painting, click here.